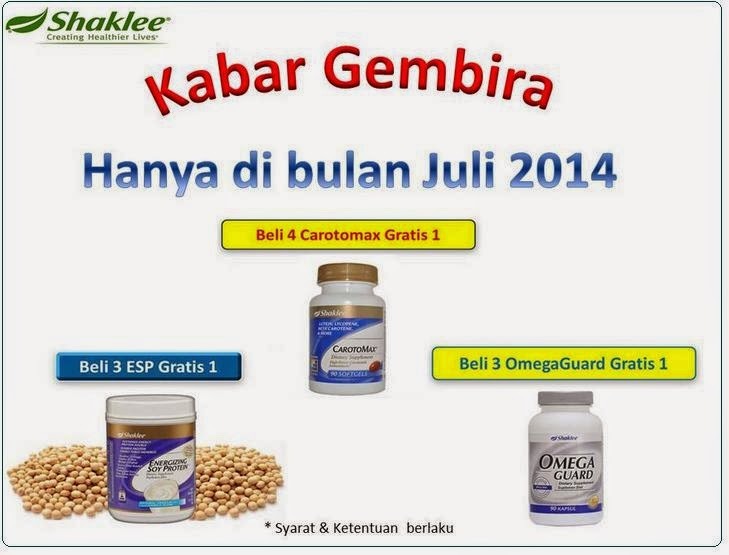 July 2014 – Sehat dan Bugar bersama SHAKLEE * A healthier life for everyone, and a better life for anyone. 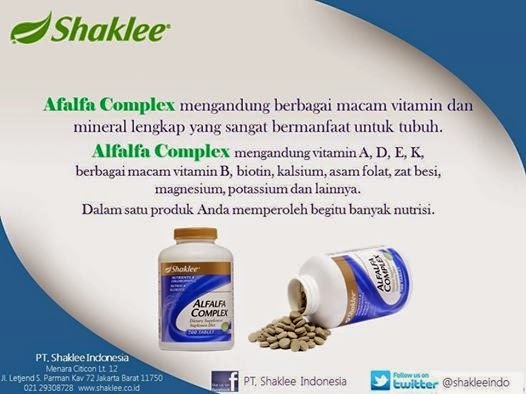 Alfalfa complex is a Shaklee Signature Formula, originally developed by Dr. Shaklee in the 1950s. Made from organically plated alfalfa (Medicago sativa) at California which are free from pesticide, herbicide and use non-chemical fertilizer. Alfalfa is know as “King of Plants”. Medicago sativa is the highest grade among alfalfa varieties. This plant takes at least 2 years to grow and its root grows more than 20 feet into the earth to absorb various nutrients. Alfalfa leaves are only harvested when they are at their peak of maturity. Matured alfalfa leaves are rich in chlorophyll. The leaves are air-dries naturally to preserve the nutrients in them. Whereas the stalks which contain no nutritional value are discarded. Thereafter, the specially picked dried leaves are ground into powder before compressing them into tablets. The whole production process is carried out under Shaklee’s stringent quality control and standard. 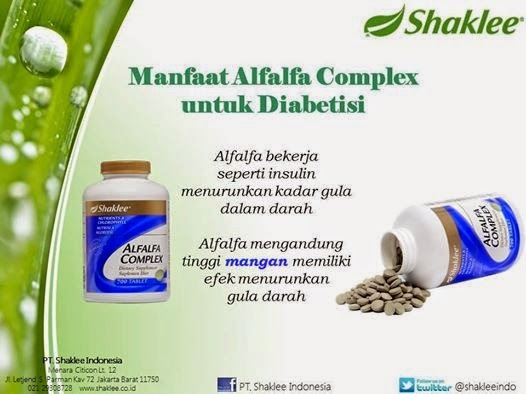 Each tablet contains about 300mg of alfalfa. Plant with most nutrients – This food has been consumed by human being for more than 2500 years and has been acknowledged as the food with most nutrients and minerals on earth. It supplements nutrients that are generally not available in fruits and vegetables as this plant is rich in protein and amino acids, chlorophyll, fibre, 15 minerals, 10 vitamins, 8 enzymes and phytochemicals. 10 tables provide the nutrients which are equivalent to 1 glass of milk. Cleanses liver, blood and colon – This is highly alkaline food that can normalize acidic body condition, removes toxins from body, cleanses liver, colon, blood and beautify skin and muscles. Combats allergies – Improves conditions of skin and sensitive nose, ringworm, body odour and athlete’s foot effectively. Improves pathological changes in colon and stomach – Improves digestive tract problems such as bloating, hyperacidity, gastric ulcer, hepatitis, constipation. Eliminates fats and cholesterol – Clinically proven that long term consumption of alfalfa will eliminate fats, reduce cholesterol, and prevent heart disease, stroke and high blood pressure. Only alfalfa contains saponins, a sponge like fibre that absorbs cholesterol. Fights tumour – Consume 30-50 tablets to alkalize the body, thus improves cancer cells and remove tumours. Relieves fatigue – Relieves fatigue and it’s a remedy for disorder ailments. Arthritis – Relieves arthritis aches and pains. 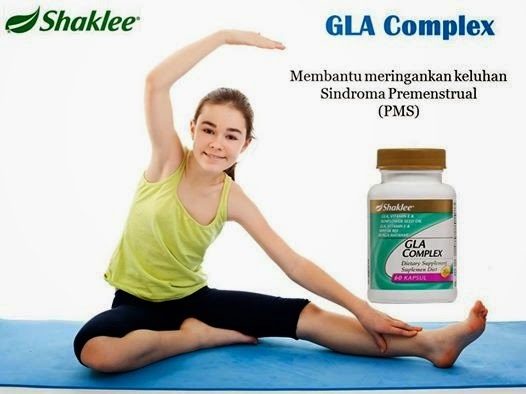 Apa itu Sindroma Premenstrual (PMS)? PMS adalah berbagai gejala fisik dan nonfisik yang dialami seorang perempuan, akibat reaksi tubuh terhadap fluktuasi kadar hormon yang terjadi menjelang menstruasi. PMS yang paling sering dialami adalah: nyeri dan kram perut, payudara kencang dan nyeri, nafsu makan meningkat, mudah marah, merasa depresi, perubahan nafsu makan, sakit kepala dan gangguan jerawat pada wajah. GLA Complex merupakan suplemen yang bermanfaat untuk menjaga keseimbangan hormon. Minum GLA Complex secara teratur membantu menjaga kesehatan siklus bulanan. Gamma linolenic acid (GLA) merupakan asam lemak omega-6 yang memiliki banyak sekali manfaat untuk tubuh, namun tidak mudah dipenuhi melalui konsumsi makanan. 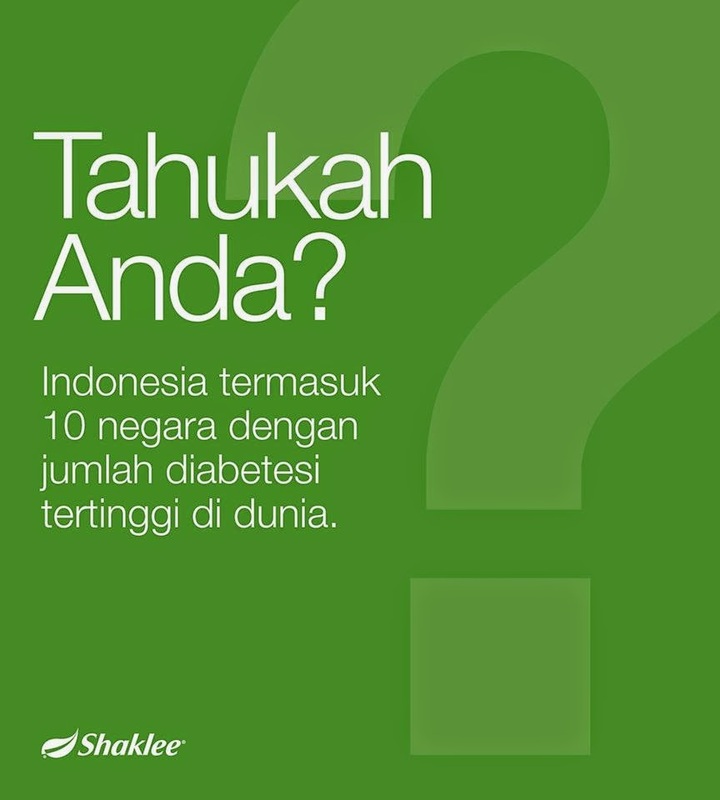 Shaklee menyediakan GLA Complex yang merupakan suplemen GLA alami terbaik dan paling efektif untuk Anda. 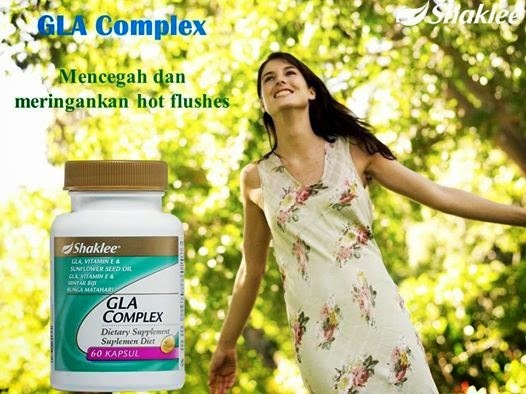 GLA Complex dapat membantu mencegah dan meringankan hot flushes saat Anda memasuki masa menopause. Promo July 2014 – Fantastis! !